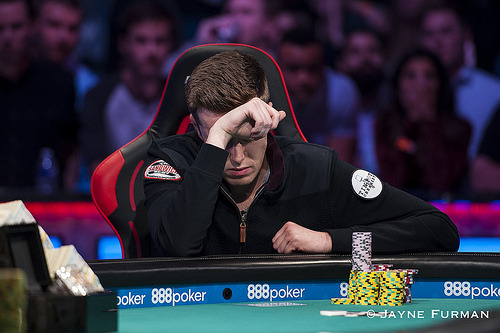 Qui Nguyen raises to 4,300,000 on the button and Gordon Vayo calls out of the big blind. The flop is and Vayo checks. Nguyen bets 4,900,000 and Vayo calls. The comes on the turn and Vayo checks again. Nguyen checks behind and the comes on the river. Vayo checks and Nguyen bets 5,000,000. Vayo calls. Nguyen quickly mucks his hand and Vayo drags the pot, mucking his hand as well. Vayo bets 3,700,000 and Nguyen check-raises to 9,700,000. Vayo calls the additional 6,000,000 and the comes on the turn. 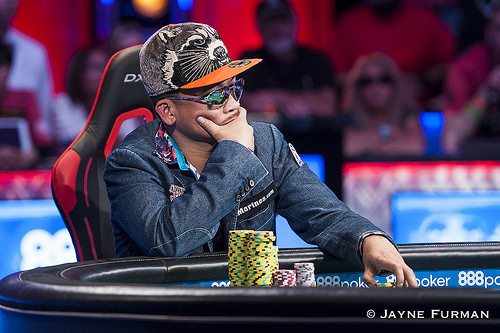 Nguyen bets 27,700,000 and Vayo calls after a minute of thought. There is over 83 million in the pot heading to the . 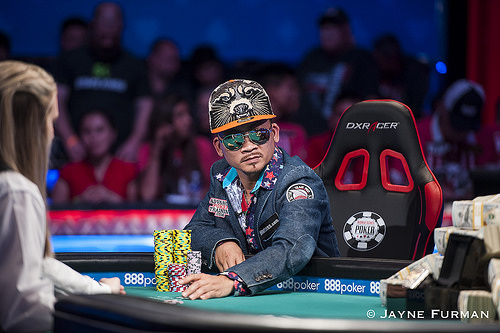 The crowd lets out a collective groan as the river card falls and Nguyen moves all in fairly quickly for effectively Vayo's remaining 106,900,000. Vayo goes into tank and the crowd goes silent. Vayo spends about seven minutes in the tank before folding. Nguyen mucks his hand and his rail goes crazy as he drags the pot and opens up better than a two-to-one chip lead over Vayo. Qui Nguyen raises to 4,200,000 on the button and Gordon Vayo folds. Gordon Vayo raises to 4,000,000 on the button and Qui Nguyen calls from the big blind. The flop is . Nguyen checks and Vayo checks behind. The turn is the and Nguyen leads out for 7,700,000. Vayo calls and the river is the . Nguyen bets 17,700,000 and Vyo quickly calls. Nguyen shows , good for two pair, and Vayo mucks his hand. Nguyen takes the chip lead back. Qui Nguyen raises to 4,700,000 and Gordon Vayo calls. The flop is and Vayo checks. Nguyen checks behind and the comes on the turn. Vayo checks and Nguyen checks again as well. The comes on the river and Vayo bets 5,100,000. Nguyen takes a couple minutes in the tank before raising to 16,000,000. Vayo calls and Nguyen immediately mucks his hand. The pot is pushed to Vayo and he mucks his hand as well. Vayo takes the pot and regains the chip lead. Qui Nguyen raises to 4,300,000 on the button and Gordon Vayo three-bets to 14,500,000 out of the big blind. Nguyen calls and the flop is . Vayo checks and Nguyen bets 17,700,000. Vayo folds, Nguyen mucks his hand, and takes the pot. Qui Nguyen raises to 4,300,000 on the button and Gordon Vayo folds. 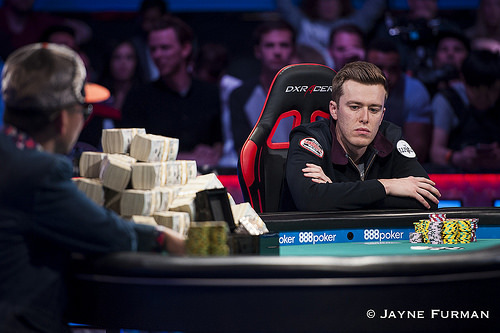 Gordon Vayo raises to 4,000,000 on the button and Qui Nguyen three-bets to 10,900,000 out of the big blind. Vayo folds and Nguyen takes the pot. Qui Nguyen raises to 4,100,000 on the button and Gordon Vayo calls from the big blind. The flop is and Vayo checks. Nguyen checks behind the comes on the turn. Vayo checks again. Nguyen bets 4,900,000 and Vayo folds. Gordon raises to 4,000 on the button and Qui Nguyen folds his big blind. Nguyen bets 3,800,000 and Vayo calls. The turn is the and Vayo checks again. Nguyen bets 7,900,000 and Vayo calls. The river is the . 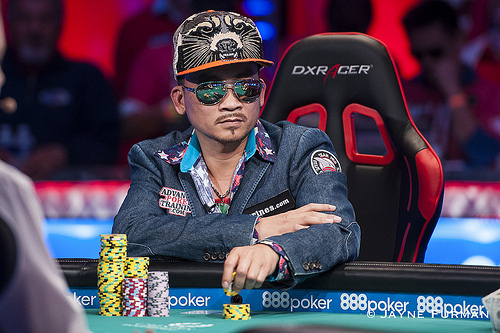 Vayo checks again and Nguyen bets again, this time 16,700,000. Vayo quickly calls. Nguyen shows and Vayo wins the pot with . Vayo bets 3,300,000 and Nguyen folds. Nguyen checks as well and the turn is the . Vayo checks and Nguyen bets 5,900,000. Vayo folds and Nguyen takes the pot. Gordon Vayo raises to 4,000,000 on the button and Qui Nguyen calls out of the big blind. The flop is and Nguyen checks. Vayo checks behind and the turn is the . Nguyen checks again and Vayo bets 3,700,000. Nguyen check-raises to 9,700,000 and Vayo folds. Qui Nguyen raises to 4,000,000 on the button and Gordon Vayo three-bets to 13,300,000 out of the big blind. Nguyen folds and Vayo takes the pot. 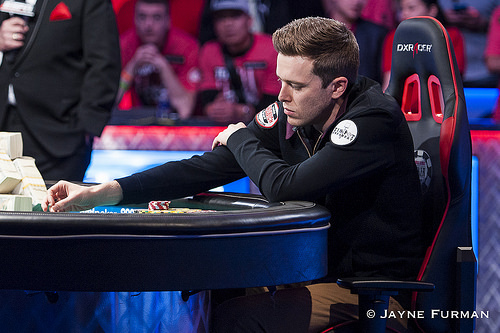 Gordon Vayo raises to 4,000,000 on the button and Qui Nguyen three-bets to 11,900,000 out of the big blind. Vayo calls and the flop is . Nguyen bets 17,700,000 and Vayo calls. 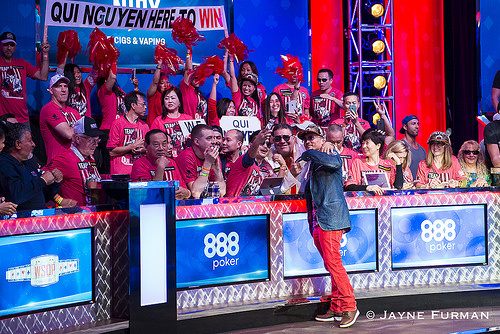 The turn is the and Nguyen bets again, this time 39,900,000. Vayo folds and Nguyen takes the pot. Nguyen mucks his hand and takes the chip lead.